Not to be confused with Douze, a river in France. 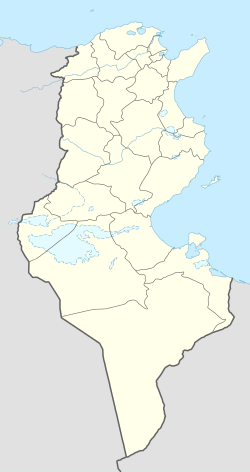 Douz (Arabic: دوز‎ dūz) is a town in the Kebili Governorate in the south of Tunisia, known as the "gateway to the Sahara." By road it is located 31 kilometres (19 mi) southwest of Blidet, 125 kilometres (78 mi) southeast of Tozeur, and 475 kilometres (295 mi) south of the Tunisian capital of Tunis. It has been called the "ultimate palm oasis", because it has over 500,000 palm trees in the area, and it is a major producer of "diglat noor" dates. In previous times it was an important stop on the trans-Saharan caravan routes. Today, it is destination for tourists who are interested in seeing the desert, and a starting point for desert treks by camel, motorcycle, or four-wheel-drive vehicle. Every year Douz hosts the International Festival of the Sahara, a four-day celebration of traditional desert culture. The festival, usually held in November or December, features traditional music and dancing, poetry readings, camel wrestling, and racing of horses and salugis. Douz is home to the Museum of the Sahara, which showcases displays on traditional nomadic desert culture of the Mrazig people who now mostly live a settled life in the town. ^ a b Trillo, Richard; Gregg, Emma (1 April 2011). The Rough Guide to First-Time Africa. Rough Guides Limited. p. 385. ISBN 978-1-84836-481-3. Retrieved 28 January 2013. ^ Google (28 January 2013). "Douz" (Map). Google Maps. Google. Retrieved 28 January 2013. ^ Hureau, Jean (June 1977). Tunisia today. Éditions J.A. p. 87. Retrieved 29 January 2013. ^ a b Fabbri, G. Magi, P.; Fabbri, Patrizia (20 January 2008). Art and History: Tunisia. Casa Editrice Bonechi. p. 103. ISBN 978-88-476-2177-0. Retrieved 28 January 2013. ^ Unesco field mission reports on Muslim countries: an annotated bibliography from 1947-1991. Vikas Pub. House. 1995. p. 134. ISBN 978-0-7069-9860-3. Retrieved 28 January 2013. This page was last edited on 10 May 2018, at 17:15 (UTC).